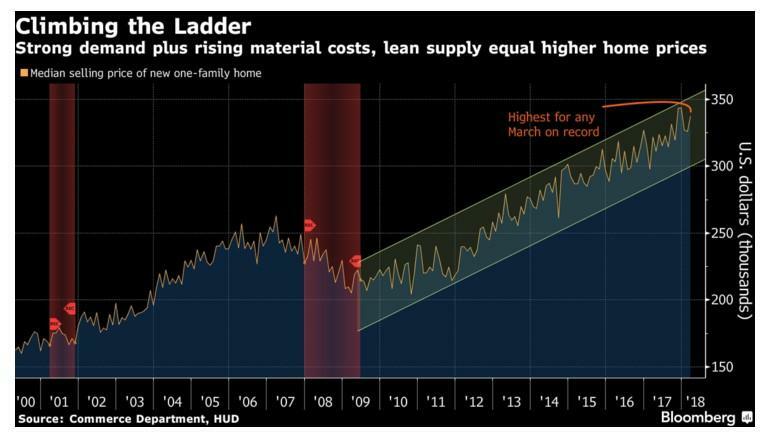 Limited supply, overwhelming demand and now the rising cost of basic material commodities used in building homes are set to keep prices moving higher, according to a new Bloomberg article out Tuesday morning. Reports on Tuesday underscored both resilient purchase activity and accelerating home prices. The S&P CoreLogic Case-Shiller index showed property values in 20 major U.S. cities climbed 6.8 percent in February, the biggest year-over-year gain since June 2014. Government data revealed a faster-than-projected rate of new-home sales in March and huge upward revisions to the prior two months. Inventories of previously owned homes are plumbing the lowest levels in at least 19 years, a key reason why resilient demand by itself has fueled price appreciation that’s extending to the new-homes market. 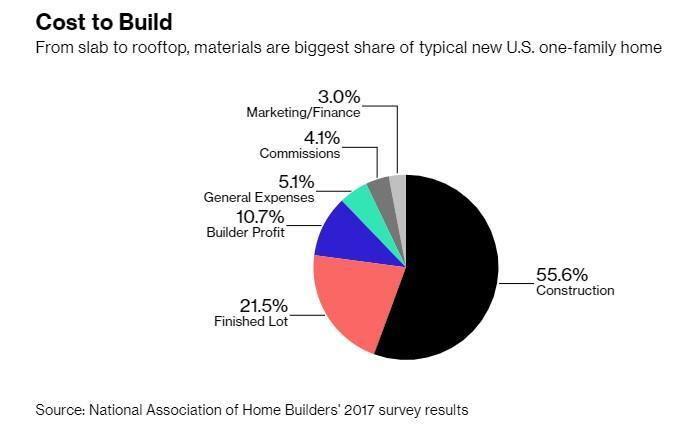 Now, with the costs of lumber and other building materials soaring together, buyers are unlikely to see any relief for some time. In fact, builders such as PulteGroup Inc., Lennar Corp. and KB Home have indicated they are having success passing along construction costs and signaled margins will remain in good shape going forward. 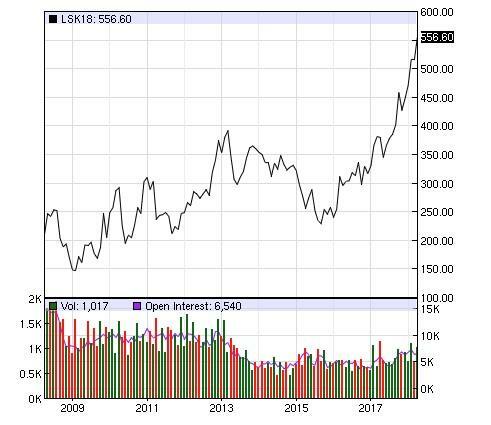 The price of lumber, for instance, has been on a path that's pushing all time highs for the better part of the last year. 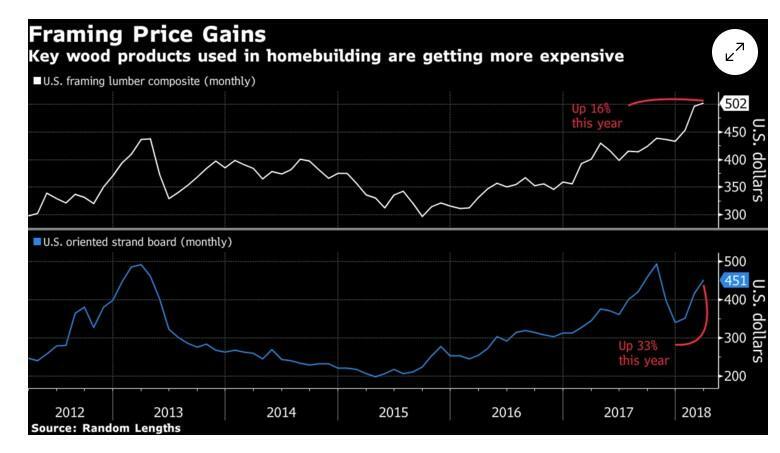 As we have repeatedly pointed out, home prices in the US have been climbing at a blistering pace (and, more importantly, much faster than wages) thanks to a shortage of supply in lumber. We analyzed the shortage back in early March of this year. We also noted builders trying to alleviate that shortage were struggling under some of the most adverse market conditions in more than a decade: a lumber shortage had pushed prices to their highest levels since the financial crisis as wildfires and a blossoming trade spat between the US and Canada have choked off some supplies. The cost of materials is important because everything from the laying the foundation to framing to painting represents the largest share of a typical single-family home purchase, according to an annual survey by the National Association of Home Builders. The framing of homes, or putting up roofs and walls, accounts for 15 percent of the cost of construction. A composite measure of the cost of lumber for framing rose 16 percent from December to March, according to data from Random Lengths, a publisher of information on wood products. And it’s not just lumber. 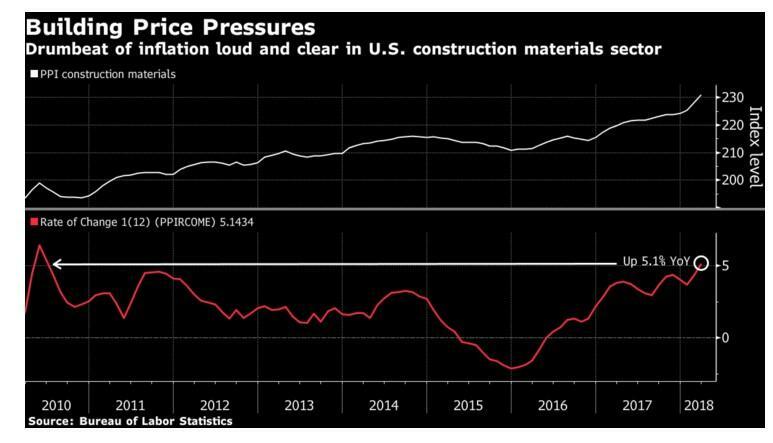 A Labor Department gauge of prices paid at the producer level for construction inputs -- everything from particleboard and plumbing to concrete and insulation -- was up 5.1 percent in March from a year earlier, the biggest annual advance in nearly eight years. It wasn’t supposed to be like this. Starting a few years ago, retiring Baby Boomers were supposed to downsize en masse, flooding the market with houses bought in the 1970s, 80s and 90s and producing a buyer’s paradise full of 70-year-old sellers on their way to Florida and eager to entertain any reasonable (or less than reasonable) offer. Based purely on demographics, today’s media should be full of stories about cocky Millennial buyers who feel no need to pull the trigger. And even without a tsunami of downsizing retirees, you’d think soaring prices would convince more homeowners to take their profits to avoid being roundtripped as many were in Great Recession. But no. Boomers are retiring, home prices are soaring, buyers are getting desperate…and hardly anyone is willing to sell. So far, neither higher home prices or a four-year high in mortgage costs have been enough to dissuade buyers. Results of the Conference Board’s consumer confidence index on Tuesday showed 1.7 percent of the group’s respondents in April planned to purchase a new home in the next six months, matching the highest share in this expansion. Regardless of whether or not the entire housing industry has been rigged to rise in price as a result of inflation, the rising cost of basic commodities isn't going to help buyers going forward, we're guessing, despite the rosy sounding outlook from homebuyers. The only thing now to do now is wait and see what happens when buyers are completely priced out of the market and the economy slows, nudging some homeowners to start to look around for a bid.